Use ‘Chimay Red’ Stack Clash Remote Code Execution Loophole vulnerabilities to infect and spread. At around 0:00 on March 25, Beijing time, our Scanmon system suggested a large number of scan activity is happening on port 8291 on a global scale. Around 2 pm, our honeypot data indicated this sudden spike was related to Hajime. Our preliminary conclusion based on its UPX_MAGIC_LE32 and some sample features confirmed that the sample is Hajime based. 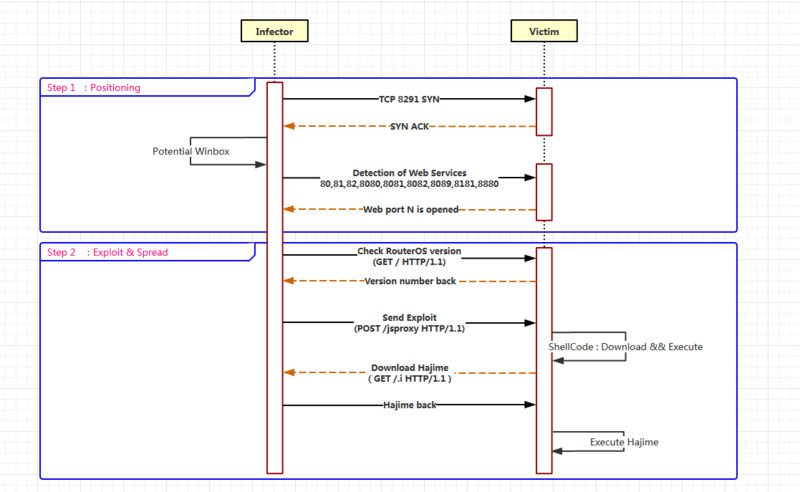 And we found the ‘Chimay Red’ Stack Clash Remote Code Execution” vulnerability related attack code in their atk module. Find a MikroTik device by checking if the target port is open on port 8291, if this port is open,the other common web ports (80,81,82,8080,8081,8082,8089,8181,8880) will be probed next. Check the version number of the device and send the Exploit which carried the Shellcode. Once the vulnerability is successfully exploited, Hajime will be downloaded and executed. From the above figure, it is not difficult to find the top three sources of the scan source are: Brazil (585k), Iran (51.8k), Russia (26.4k). Update to the latest version from MikroTik. IoC 下载服务器 159.89.190.243 img.namunil.com cdn.namunil.com 下载URL hxxp://img.namunil.com/ash.php hxxp://img.namunil.com/bsh.php hxxp://img.namunil.com/rsh.php hxxp://cdn.